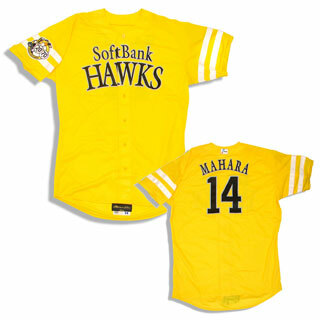 uniforms « Japan, Hockey, Baseball, etc. The wonderful UniWatch blog does a great job in reviewing all 16 teams’ uniforms that made it to the Frozen Four (Sixteen). 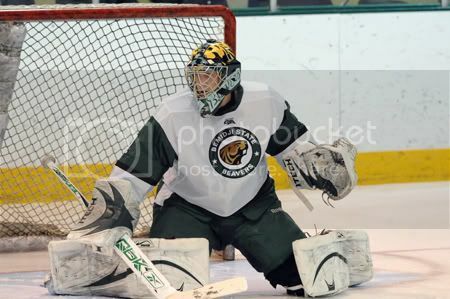 Eri Kiribuchi’s Bemidji State makes the list, but Paul Kariya’s alma mator Maine doesn’t (though it does in the comments). Lots of great classic looking unis (some resembling NHL unis) all around, with some horrendous alternate jerseys. Why do you need alts for college hockey? Marketing rules. 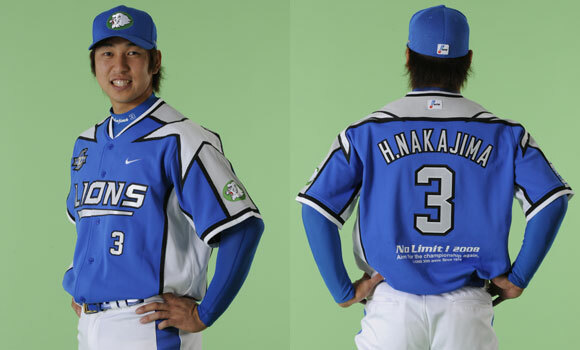 Following the NPB throwback uniforms post, this time we have the NPB non-throwback alternate uniform special. 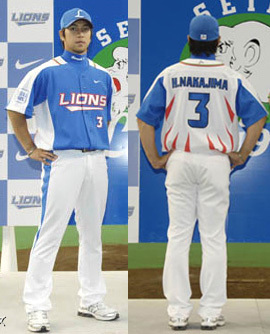 First, let’s just get a general sense of what NPB uniforms look like. 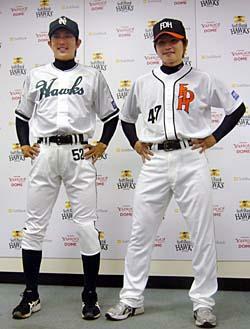 These are all the NPB managers wearing their home uniforms circa 2006. The only major change we’ve had since then is the Tigers who are now using their 80’s throwbacks full-time as their home unis (mentioned in the post linked above), great move! 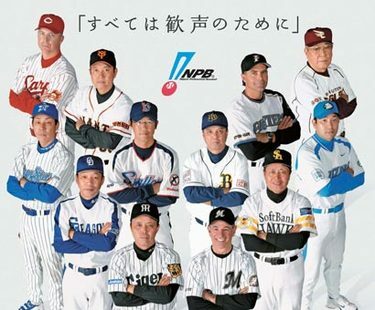 I don’t know of any Hiroshima Carp alternates, so I’ll just note that that’s Marty Brown pictured on the top left corner. 2006 Interleague Uniforms can be found from the post linked at the top of this post, they were 80’s throwbacks. 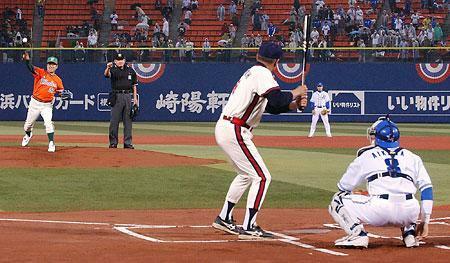 Managed by the flamingo stance slugging legend himself, Sadaharu Oh. Managed by Bobby Valentine. Fantastic fan support, ugly alternate uniforms. Get a load of this. 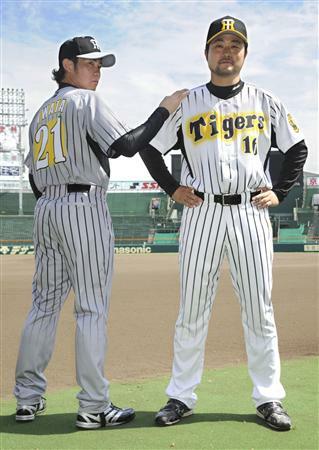 NPB has caught onto the the throwback uniform craze in recent years, so without further ado here are some unis that made an appearance on the field. 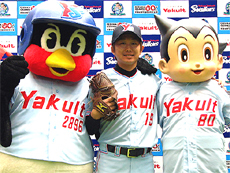 Firstly the Hawks this season celebrated their 20th season since the franchise relocated to the island of Kyushu and the 70th season since its founding with these uniforms. 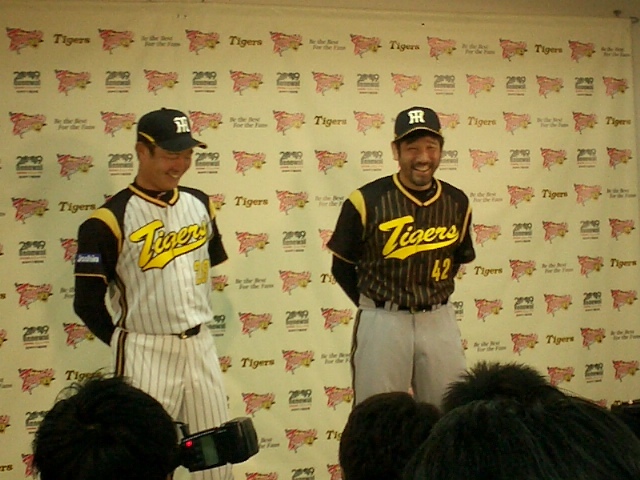 The Nankai Hawks (1947-1988 ) uniform on the left looks sharp, and the Fukuoka Softbank Hawks (1989-2004) look alright but is way too recent to feel any sort of nostalgia (Kenji Johjima was wearing that exact Daiei outfit before leaving for Seattle). For a more nostalgic look, the Hawks should’ve chosen the early Daiei look complete with the “hawk helmet” (eyes painted on the side and everything). 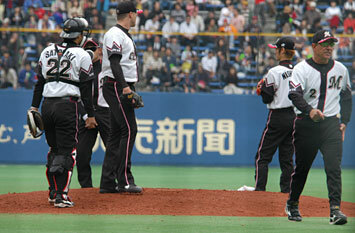 Still, both uniforms are much sharper than the current “slow-pitch” Softbank uniforms. 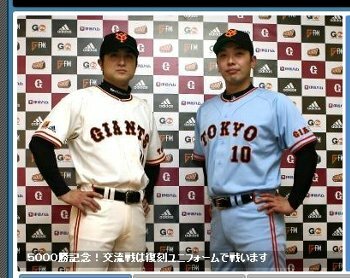 Below are the Giants throwbacks (home and away) that they wore last season as part of their franchise’s 5000th win celebration. 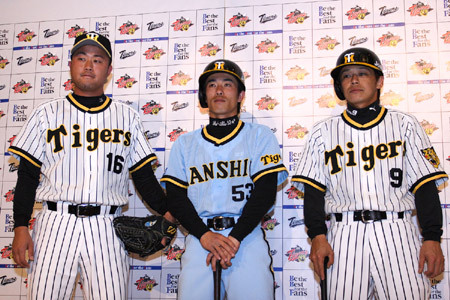 The uniforms are from their absolutely dominant V9 era (1965-73) when they captured 9 straight Central League pennants, and captured the hearts of almost everyone in Japan as there were few entertainment options available back in the day and Giants games were broadcast every night. 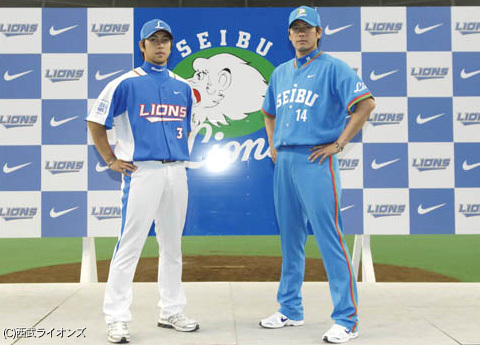 Saitama Seibu Lions also reprised their golden era in the 80’s with the blue throwback away uniforms on the right last season which were worn for some special games. Since the team team had a dynasty back then, the all blue look doesn’t evoke possible gaggage, but great memories instead. 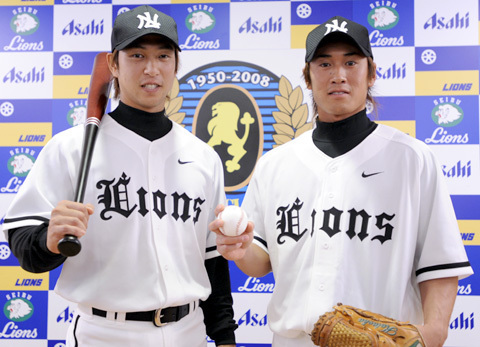 The Lions went even further back into their history with the Nishitetsu Lions (1951-72) throwback unis this season. They look nice, except for the unnecessary Nike logo (like in the throwbacks above), but since the these uniforms were worn before my time, it doesn’t do much for me other than the fact that throwbacks are almost always better than lame special edition summer/sunday/interleague uniforms designed by some famous designer (which I will get to in a future post). 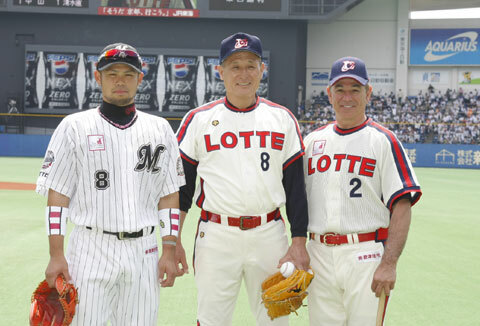 Chiba Lotte Marines went throwback this year too with these Lotte Orions (1969-91) uniforms from back in their Kawasaki days which you can see here with Bobby Valentine. Apparently the Lotte Giants in Korea has the exact same throwback uniforms which they wear on occasion. Since both teams are owned by the same Korean-Japanese parent company, there’s a branding effort there (even though the Korean team is supposedly named after the Yomiuri Giants). Next time, some selection of non-throwback special uniforms. 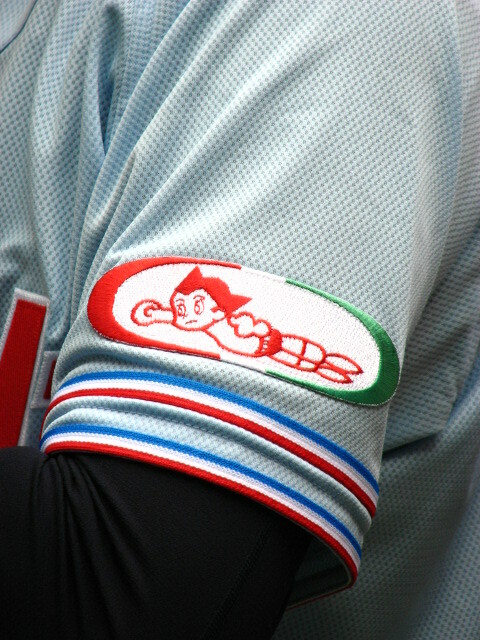 Edit: As reported earlier, the Tokyo Yakult Swallows wore powder blue uniforms from their Yakult Atoms (that’ll be the Mighty Atom aka Astro Boy!) during the Golden Week holidays in May.